Like most people, when I heard news that Steve Irwin, the Crocodile Hunter, died, I immediately went online to check the main news outlets to see if it wasn’t a hoax. Sure enough, much to my shock and horror, it really happened. I was really floored. I was saddened by Richard Pryor’s death, he meant a lot to me as a comedian who never failed to crack me up, and the same with Rodney Dangerfield. 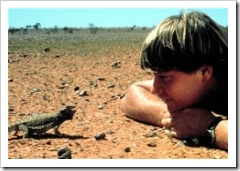 But Steve Irwin was more involved in my life, as I had watched so many of his shows, seen so many interviews with him, and a couple of documentaries about him. I know everywhere you go, whether online, on television, even the ballpark people are talking about him. Some may even be getting sick of hearing about it. However, I’d like add my own thoughts to the whole thing, so bear with me. Sure, it was likely inevitable that he would get killed, and most everyone thought it’d be by a crocodile. It still doesn’t make it fair, because he was making such a positive impact with so many people, no matter how young or old they are. Steve Irwin gave me a newfound appreciation towards some of the more unsavory wildlife out there, and he also showed that you can be deeply passionate about your job and still have fun. To lose him really creates a void in the world where someone left such a footprint on everyone. My roommate, being female, thinks all snakes are yucky and evil, but Steve Irwin has changed her mind somewhat, and that, my friends, is a huge deal. There’s been some who called him a careless daredevil, a thrillseeker who was pushed more and more to do dangerous stunts for better television ratings. Steve himself said he does that to himself, he’s always challenging himself. We all do it, if we never challenged ourself, we’d become complacent and bored in our life. However, I don’t think he belongs in the usual classification of daredevils/thrillseekers. He was calculated, smart, and careful. He was as much a proud father as a conservationist. He always had experts on hand when he was dealing with animals he wasn’t too intimately familiar with, and always did research beforehand. It’s not like he was tempting fate unneccesarily just for the adrenaline, he was doing it for a good purpose. One last thing, something that has me a bit annoyed. I’ve heard a lot of Australians online and in the media complain about Steve Irwin. They say his accent is exaggerated, that he’s a flamboyant showman, and people outside of Australia ask them if they have a crocodile in their backyard because of them. They regard him as an embarrasement to the country. Which shows me how utterly shallow a lot of Australians are. Boo-frickety-hoo! Because I’m American, people think President Bush and automatically assume I’m stupid and arrogant. People that paint such a broad brush don’t even get a second thought from me. If they’re so stupid as to assume something so asinine, then I’m stupid if I let them affect me and my attitude. I’m going to miss Steve Irwin a lot, and I can’t begin to imagine how painful this is for his wife, Terri, and their two kids. The little girl, Bindi, is old enough to be severely affected by this news, and my heart goes out to that family. Steve has done so much for the planet, for Australia, and on top of it all, he was a great dad. He’s a hero a lot of people will sorely miss. Can’t agree with you more, can’t agree with you more, the ones that really get me are the ones that gloat over his death. There are Ausralians that consider him an embarrassment, but they really are in the minority. It’s just the case that their voices were heard more louder than the rest of us who thought he was great. Media outlets wouldn’t find “Most Australians love Steve” articles that interesting to make, so you don’t really read about that. Steve was dedicated to the conservation of wildlife, a genuine great guy, and one of the very few in the TV/Media world. The money he made from television shows went back into Australia Zoo and its animals, buying acres and acres of land to conserve, his animal hospital and rescue service, and donations to many wildlife charities and funds. And the guy lived in a modest house at his zoo. It was found out a while ago that through some journalist digging via freedom of information act that he stopped a law that would have enabled businesses to open up crocodile hunting expeditions for the rich. He did this with no media attention, and wanting no acknowledgement whatsoever. That’s a testament to the kind of guy Steve was. Steve was a great conservationist with only the best intentions. “WYSIWYG”. Will be sadly missed by a hell of a lot of people, world wide. Condolences to his family & friends. hi terri and the kids. i feel sad for u and or kids it must be very hard for you. i watch steve when i was bendis age and i loved his show. once i herd that he die i was upset. will i hope the best for u and ur family. i`m sorry to hear about what happened. i’m glad he died doing what he loved most. it was a tragity that no one will ever forget! we know you look down on each and every one of each and everyday. we love you steve irwin! Steve touched all of our lives, especially my kids. They have always loved Steve as have all of us. We will sadly miss him. This world has lost a true hero. We are praying for Terry and the kids. They say time heals all pains, but I read these responses and still cry over Steve’s death. The part about being in heaven and touching the angels wings and saying CRICKEY; ISN’T SHE GORGEOUS really brought tears because it’s probally true. I have been seeing Bindi’s new show “Bindi’s Treehouse” and I really think Bindi is going to continue her Dad’s love and protection of all animals. We miss you Steve!